AKG unveils four new wireless headphones at IFA 2018 | What Hi-Fi? Headphone launches are two a penny, but new headphones from AKG are always worth paying attention to – it’s won armful of Awards trophies in recent years, after all. 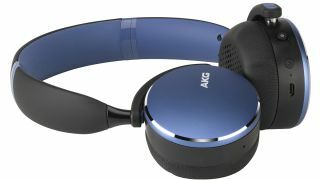 First up is the AKG N700NC (pictured below) – an over-ear wireless pair with Adaptive Noise Cancelling priced at £329. The battery offers 20 hours of music playback when using Bluetooth, but lasts for 36 hours when used wired. The N700NCs have large, memory foam and leatherette ear cushions, a tangle-free fabric cable with a one-button remote, controls on the ear cups, and can be folded up. You can also change its settings using the AKG Headphones app. The AKG Y500 (pictured at the top) is the much-anticipated follow up the to Award-winning Y50BT headphones. The new Y500s remain on-ear designs, with a soft-touch headband and memory foam ear cups. It features Ambient Aware technology that lets you listen to music and be aware of your surroundings (so you don’t get run over or miss that train delay announcement) and have a 33-hour battery life. The Y500s will be available in four finishes of black, blue, green and pink for £129. The non-wireless AKG Y50 headphones will continue on until Spring 2019. Lastly, there are two new wireless in-ear models: the Y100 (£89) and N200 (£129). Both are Bluetooth in-ears and have eight hours of battery life. The N200 uses a fabric cable, weighs just 15.6g, and its semi-closed earbuds magnetically snap together, too. The Y100, meanwhile, shares the Y500’s Ambient Aware feature, uses flexible, ergonomic materials and comes with a three-button remote. The AKG N700NC, N200, Y500 and Y100 headphones are due out this year, but exact availability for each models is yet to be confirmed. We’ll update as soon as we know.